Within just a few minutes after you order, you should receive an email with your registration code and instructions on how to enter it into the game. If you do not receive this email, be sure to check any junk mail folders you may have as it is sometimes filtered out. 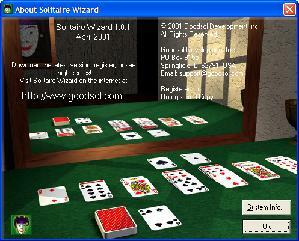 The subject of the email is Your Solitaire Wizard Code and Instructions. If you do not receive your email within 24 hours, Contact us. Click on the download button below and download the trial version. Then run the downloaded file to install, and use your registration code to register it as below. You can request that it be sent to you again from our Lost Code Lookup. Run the game. Go to the main screen (where you see the names of all the games). Go to the Help menu and select About. This will bring up the About screen. Press the R key to enter your code. See our Order Support Form. See our Technical Support Form. Copyright 2001-2015 Goodsol Development Inc., PO Box 9155, Springfield IL 62791.